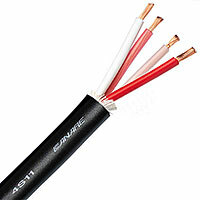 We feature great bulk speaker cable from Canare, Gepco, Mogami, Sommer, Lake, Belden, and more. Speaker cables designed for distribution of audio signals from power amplifier to loudspeakers, in either Quad (4 conductor) configurations, or standard 2 conductor (shielded and unshielded) configuration, as well as standard zip-type configurations. Canare StarQuad configuration speaker cable is great for use with Neutrik speakON Loudspeaker connectors!